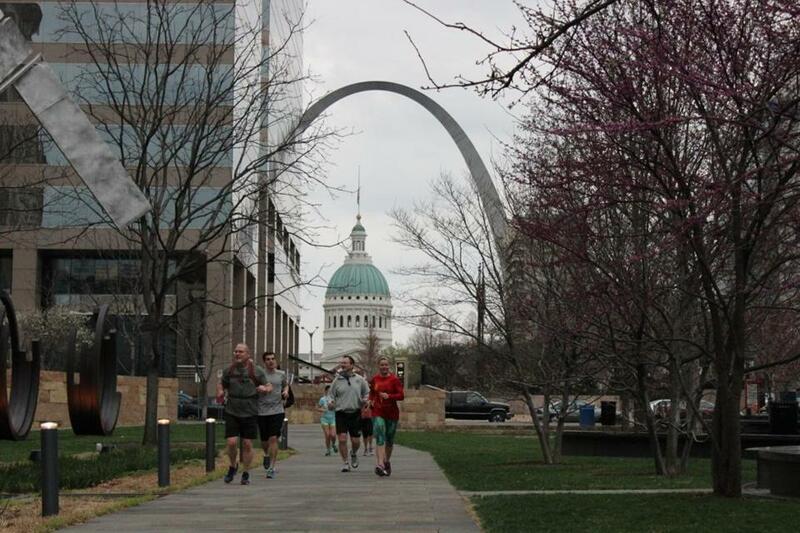 The Old Courthouse (1839) and The Gateway Arch (1965) are landmarks to runners through St. Louis. ST. LOUIS — Sweating in the soggy air of a Midwestern dusk, Joe Michaelree points out the purported burial site of the Ottawa war chief Pontiac. Michaelree is short of breath, but not from the humidity or the emotion of recounting the tragic story of the man who led a largely forgotten native insurrection against the 18th-century military occupation of the Great Lakes by the British. He’s guiding this sightseeing tour of St. Louis at a brisk run. There’s a surprisingly big market for seeing travel destinations at a run. Measured solely by the number of finishers of road races last year in the United States, there are at least 19 million serious runners nationwide, more than twice as many as there were just a decade ago, according to the industry group RunningUSA. And runners are disproportionately college-educated — more than twice as many have degrees than the national average — with higher salaries, giving them the disposition and disposable income to travel. That doesn’t mean people have to train to take a running tour. Most tours average a comparatively slow pace of about 10 minutes per mile — that’s the speed of the Run With a Ranger tour of the National Mall in Washington — cover no more than three or four miles, and stop often at landmarks, scenic vistas, and historic sites. Herself a marathoner and high school field hockey, soccer, and lacrosse coach, Blackman said the running tours were the perfect way for her to sightsee. Running tours began in Europe and took off at blazing speed. You’ll find them now in Amsterdam, Barcelona, Berlin, Brussels, Budapest, Copenhagen, Dublin, Edinburgh, Lisbon, London, Madrid, Oslo, Paris, Prague, Rome, Stockholm, Venice, and Vienna, and also in Auckland, New Zealand, Melbourne and Sydney, Cape Town, Tokyo, Seoul, Shanghai, and in Santiago, Chile, and Buenos Aires. They’ve also started racing across the United States, mostly within the last three years. Boston has three running tours, whose guides say half their customers are locals. There’s one each in Providence and Portland, Maine. A single, fast-growing company called City Running Tours — founded by a New York chiropractor (and runner) — serves 16 other US cities, including Austin, Chicago, Denver, Minneapolis, New York, Philadelphia, San Diego, San Francisco, Seattle, and Washington, D.C., and there are independent running tours in Atlanta (motto: “There’s no better way to experience a city than by running through it”), Memphis, St. Louis, and Las Vegas, which offers “sightruns” of the Vegas Strip and through the nearby Mojave Desert. If the group runs are kept at a comfortable pace, however, guiding them is a tricky mix of being able to talk while running — often backward, and on crowded city streets — Ackerly said. Jonathan Garner was training for a road race when he had to fly to Austin from Boston for a job interview. This is a trend that isn’t standing still. Its next incarnation? Full-on fitness tours. Elite Fitness Tours in Baltimore takes visitors to that city’s major historical landmarks while also putting them through a fitness regimen or yoga workout at each stop. There’s a similar tour in New York. The running tours range widely in price, from free for the National Park Service’s Run With a Ranger tour on the National Mall, to $75 for custom private running tours of New York. Some tours throw in water, T-shirts, digital photos, discount coupons for local running stores, and running product samples. But Ackerly is convinced most people take his running tours for the naturally occurring rush they get of dopamine and serotonin.